Sandra Britt-Huber and Nancy Hart Servin, co-facilitators of the San Francisco Special Interest Group (SIG), sent this reminder about tomorrow's meeting. The March SF-SIG meeting will be a group discussion – it's story time! Please come and be prepared to bring a slice-of-life story about your San Francisco heritage family or research interest to share at our meeting this Saturday. Compliment your story by bringing pictures or records to enhance your story-telling experience with others. may be able to help you find the missing connection. Please bring your copy of Nancy Peterson's Raking the Ashes: Genealogical Strategies for Pre-1906 San Francisco Research for reference. We'll also be sharing our experience at the recent San Francisco History Expo. 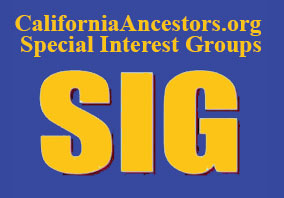 Lot's of people stopped by the California Genealogical Society table and there was considerable interest in our SF-SIG. Meets third Tuesdays, 6:30 p.m. - 8:00 p.m. Next meeting January 15, 2013. Meets third Saturdays, 10:00 a.m. - 11:30 a.m. Next meeting January 19, 2013. Please note: the Genealogy Writing SIG is on hiatus. Download the San Francisco SIG information flier.